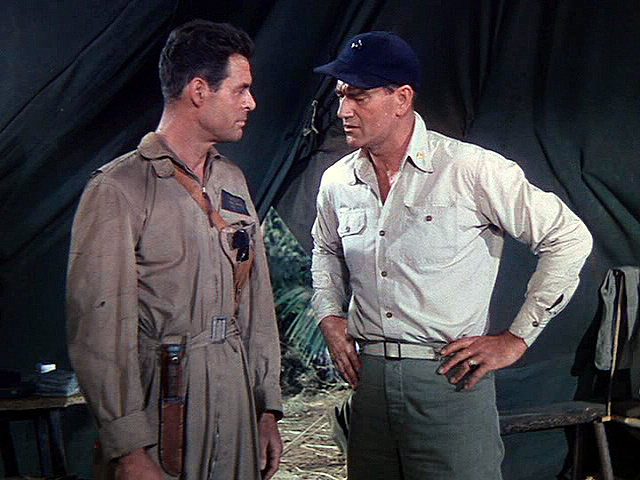 Another aviation-centered picture from billionaire Howard Hughes, Flying Leathernecks is also an uncharacteristic feature from director Nicholas Ray. Set during World War II's Battle of Guadalcanal, it essentially boils down to a two-hander pitting the stalwart John Wayne (Sands of Iwo Jima ) against the pugnacious Robert Ryan (On Dangerous Ground ). Given its use of an incredible amount of actual war footage, I'm assuming the story was built around the footage used (especially with such unique images as a pilot bailing out of a downed aircraft). So it's funny to think of a left-leaning maverick like Ray having to conform to all of these elements—a notoriously demanding eccentric as his studio chief, an equally iconic star who no doubt had demands of his own (both right-wingers) and the limitations demanded by such specific footage—in order to complete the war movie. Flying Leathernecks's integration of existing dogfight footage is quite impressive, especially given the rarity of color battle footage at that point (which has led to unconfirmed speculation that this was actually film of the Korean War). Ray wisely uses this opportunity—his first color film—to experiment with what would become one of his hallmarks, judicious application of color to evoke an emotional response. In a mission briefing scene early in the film, staged in a bivouac built against a rock wall (like Vienna's Saloon in Ray's Western, Johnny Guitar), one can see a glimmer of the director whose use of color would become so intrinsic to his later films. Ray's use of vivid oranges and magenta to delineate the plan of attack breaks the visual monotony of the Pacific Theater color palette (golds and greens) which would become traditional in films of this ilk. In most other respects, Flying Leathernecks is formulaic. Kirby: ...You just can't bring yourself to point your finger at a guy and say, Go get killed. You gotta tear your guts out worrying about his flight record, or because some dame back in the States is giving him the brush-off... or whether he knows whether his baby's born yet or not. You got enough troubles of your own for one man. Stop trying to pack everybody else's around. Schedule that mission. I've got a belly full of you, and I'm not buying the bill of goods you're selling. In my book, it's easy to be a turtle; put a shell between yourself and the rest of humanity. This scene crystallizes everything good and bad about the film: the cliche tough guy patter; the rote macho posturing; the volatile onscreen tension between its two leading men; and Ray's own attempts to slip in some of his own commentary. Otherwise, Flying Leathernecks pays little attention to its supporting characters. The rest of the squadron's pilots live in anonymity; only a few break through to the forefront with some character details and usually right before each is killed in action. The most notable is played by future director Don Taylor (Stalag 17), a Texan who modifies his uniform with the addition of cowboy boots (nicknamed "Cowboy" of course) and happens to be Griff's brother-in-law. All of these character details pile up slower with regard to him than they do with other walk-ons, telegraphing his eventual sacrifice—as a result of a rare executive decision by Griff—as the most significant in the film. Ryan's Griff gets promoted as a result of this decisive moment. A reading in which the "bleeding heart" Griff stands in for Nicholas Ray yields an interpretation of Flying Leathernecks as a bit of right-wing propaganda in which Ray sadly acknowledges surrendering his political ideals to the requirements of the genre he was working in. Future films wouldn't see the director give in to his superiors as easily. This is a revised version of a review first published on August 24, 2010.